RIP chicks and totes. If the devil is in the detail – and in fashion it often is – then the devil is a weird animal placed nonsensically in a spring fashion shoot. Joeys, pigeons, flamingos, leopards – you name it, if it’s furry and undomesticated, it’s probably in a photoshoot, on a magazine cover or printed on a blouse this season. What do a baby kangaroo and a rat with wings tell us about spring fashion? 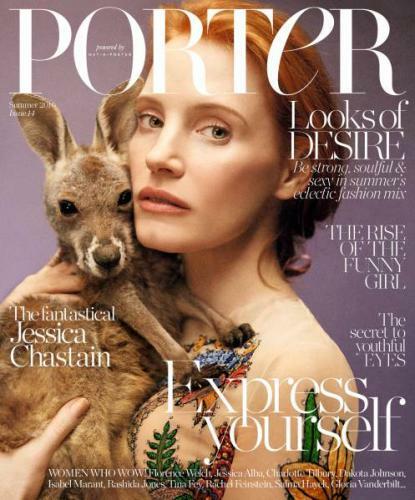 Jessica Chastain and a (literally) springy friend adorn the summer issue of Porter magazine. “I want to be able to have my family and have this normalcy and go see a play and not have the audience watching me watch the play,” says actor Jessica Chastain, another A-lister chasing the elusive train of normalcy by holding a baby kangaroo on the cover of a magazine. The natural makeup says one thing – pared-back, intimate, the “real me”. But why the joey? For one, kangaroos are good at fighting, and Chastain is quite vocal about gender inequality in the magazine interview; they are also family creatures (see the quote above); and terrestrial kangaroos are vegetarian, like Chastain. Plus, the longer you look at it, the more the two faces seem to merge. It’s quite hypnotic, really. So, you see, the joey makes absolute sense. Gucci loves a weird animal, and a weird setting. 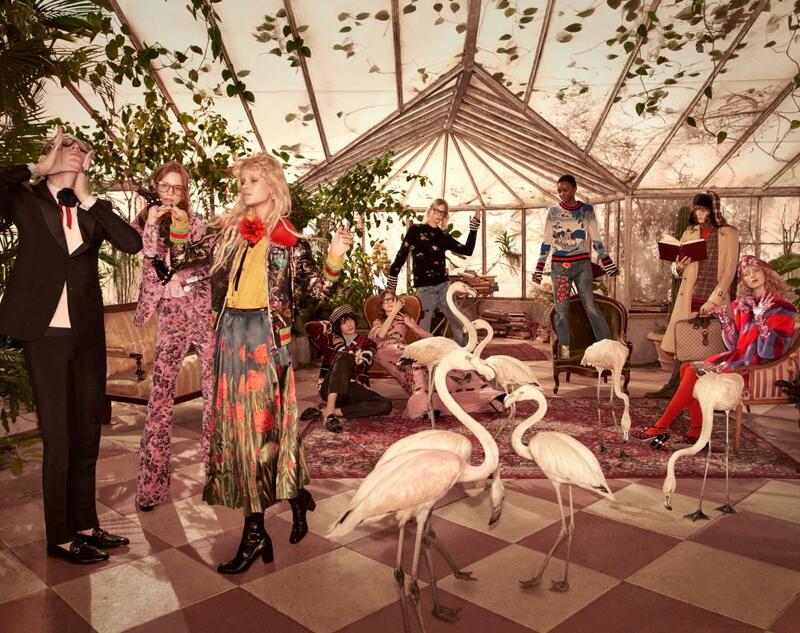 Indeed, compared to last season’s campaign – models on skateboards in Berlin’s Hauptbahnhof station holding peacocks – “flamingos in a conservatory” is a relatively staid concept. But Gucci (by which we mean new Gucci, under the direction of Alessandro Michele) leans towards the kitsch and fantastical. Photographed and directed by Glen Luchford, who is famous for his exotic and cinematic imagery, it makes for an arresting (Instagrammable) image, something Gucci has down pat. New Gucci – in love with weird animals. Other thoughts on the flamingos: according to SeaWorld, they have well-developed colour perception. Conversely, the models in this campaign appear to be visually impaired, so there’s a cheeky bit of role reversal. Maybe we are the flamingos looking at the models? Maybe the models are in a metaphorical zoo? Or maybe it’s as simple as Gucci likes birds. It’s anyone’s guess. Invoking the spirit of the leopard – or just tired? Not strictly true – one shoot, in US Harper’s Bazaar magazine, sees Kris Jenner in a circus tent with a massive lion in the background – but it has been a while since this arm of the big cat family has been properly represented in fashion. Here they are, though, printed on Kate Moss’s pyjamas for Equipment, and here is a model, lying on a tree like a leopard, in Marni’s spring campaign. Does the Equipment campaign buy into the adage that a leopard can’t change its spots (ie pyjamas will always be pyjamas)? Is this model lying in a tree like a leopard because she’s tired of life, fashion and the ground? Or is it all of those reasons? All good, all food for thought. Daria Werbowy and a leopard-covered Kate Moss model for Equipment. 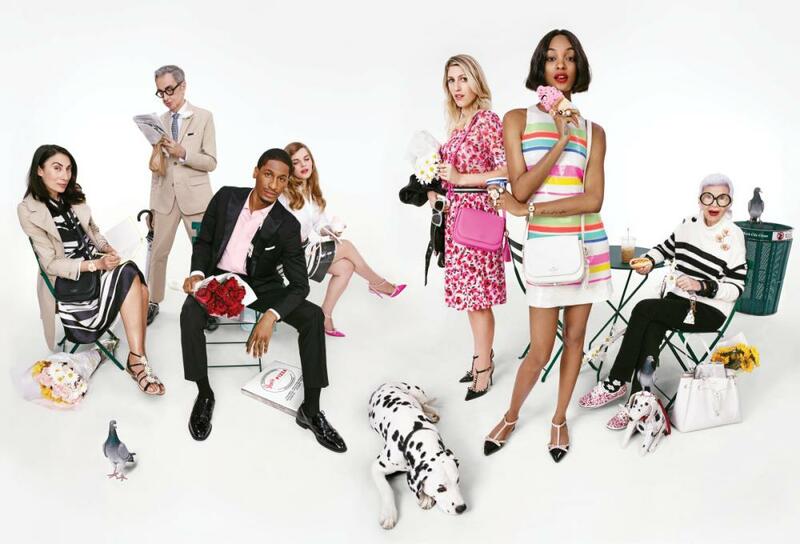 Kate Spade’s squad for the spring/summer 2016 campaign. Finally, a concept we can get on board with: here are lots of models and non-models like Jourdan Dunn (model, British) and Karley Sciortino (a writer, once based in London). And here are some dalmatians (English literature’s favourite dog) and pigeons (our favourite bird). Dogs are a perennial in ad campaigns, but the pigeons? Well, US designer Kate Spade recently opened her flagship store in London; the obvious answer is that she’s trying to speak to us, the British public, about how on board she is with Britishness. The less obvious (but more likely answer) is that their dirty wings match fashion illustrator Robert W Richards’s tie. Still, quite fun.